This is a tasty burrito filling with lots of flavor from the seasonings and jalapeno peppers. Use chicken thighs for the very best flavor and texture. They stay moist and shred nicely. This recipe makes enough burrito filling for at least 16 burritos but can be easily halved. Or, make the whole recipe and freeze some of the chicken filling for another meal. Saute the onion, bell peppers and jalapeno peppers until softened. Add the garlic and saute for 1 minute longer. Transfer to the slow cooker. Add the chicken, chili powder, oregano, cumin, coriander, salt and pepper. Cover and cook on LOW for 5 to 6 hours, or on HIGH for about 2 1/2 hours. Carefully drain off excess liquids and shred the chicken pieces with a fork. Stir in the refried beans and 1/2 cup of salsa or enchilada sauce. Cover and continue cooking on LOW for about 30 minutes to 1 hour. Warm the tortillas following package directions. Put about 1/4 to 1/3 cup of chicken mixture in the center of a warm tortilla. Top with some shredded cheese. Fold the ends over the filling, then roll to encase the burritos. 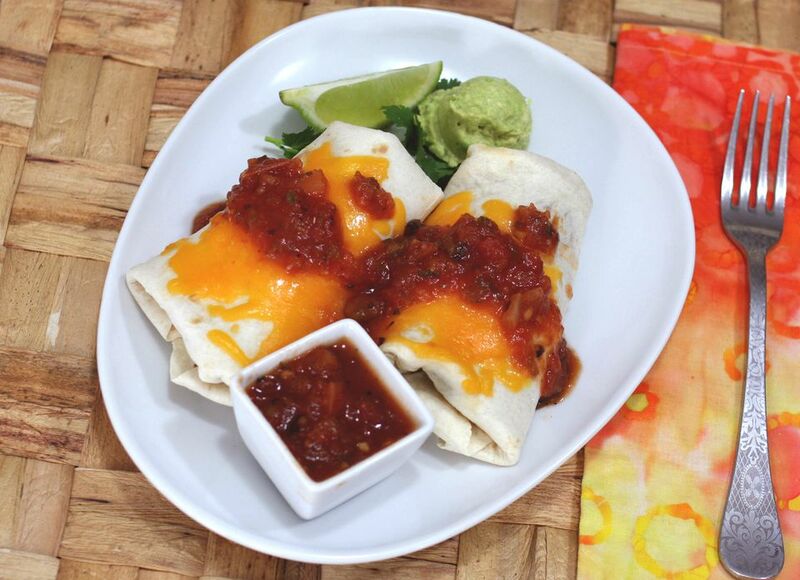 Serve with more salsa and shredded cheese. Tip for leftovers: To reheat a cold burrito, wrap in foil and heat in a 350° F oven for about 20 minutes or until hot. Add about 10 to 15 minutes for frozen burritos.